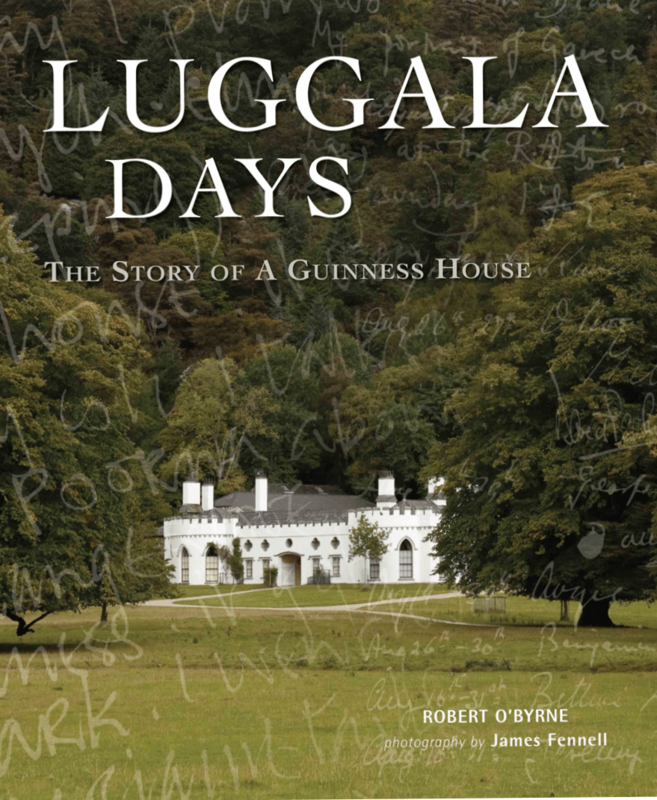 My New York pal James Andrew has written some kind words about Luggala Days in www.whatisjameswearing.com. Read it for yourself and simultaneously discover the delights of James’ own blog. 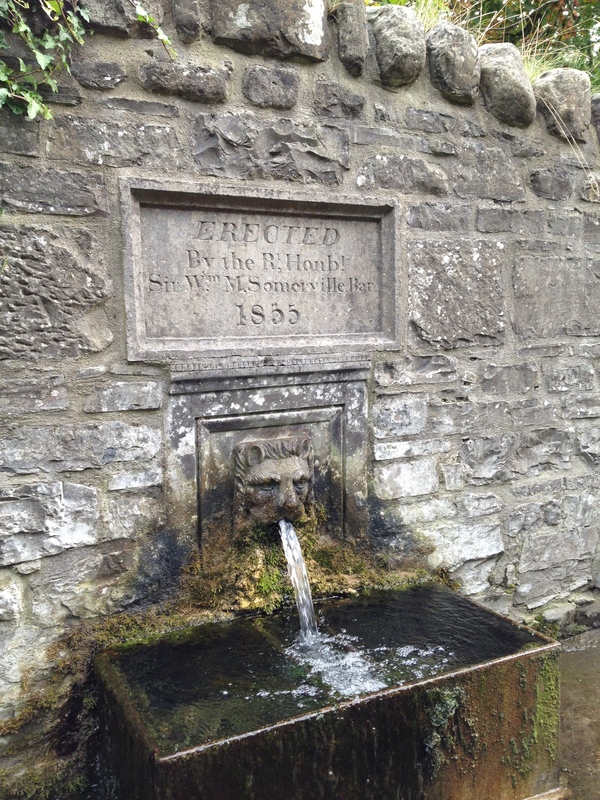 On the road leading from Kentstown to Balrath, County Meath can be seen this drinking fountain which, as the inscription explains, was erected by Sir William Somerville in 1855. Look at the way creeping moss has extended the lion’s beard all the way to the basin. The water for this amenity comes from a well some miles distant from which, according to ancient legend, St Patrick drank while on his way from Slane to Tara. Sir William Somerville (1802-1873) was a Liberal politician who served as Chief Secretary for Ireland from 1847-1852; just over a decade later he was made a peer as Lord Athlumney. The fountain is set into the demesne wall of what was once his family seat, also called Somerville. This is an engraving of Broadstone on the north side of Dublin dating from 1821 and based on a picture by George Petrie. The most prominent building is the King’s Inns, designed by James Gandon in 1800 and by that date nearing completion. It looks little different today but the surprise is to find a harbour immediately in front since this has long gone. 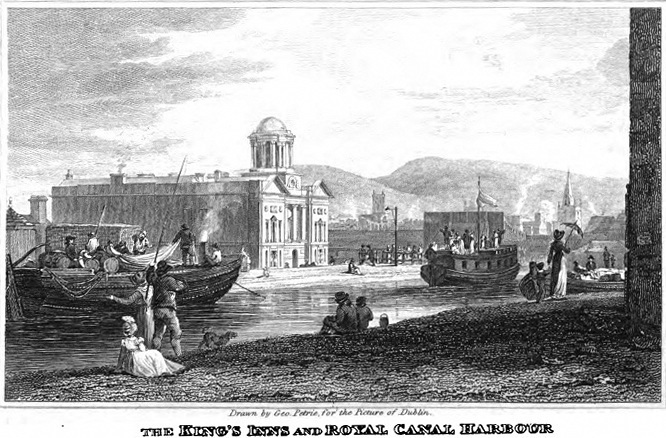 As the picture’s caption reveals, the harbour was constructed to serve the Royal Canal, its site chosen because of proximity to many key resources such as the city markets as well as the Linen Hall and various penitentiaries and workhouses. Although Broadstone Harbour is no more the Royal Canal survives, despite sundry attempts over the past 150-plus years to damage it irreparably. Linking Dublin to the river Shannon and intended to encourage greater trade between the west and east of the country, the enterprise was plagued with problems from the very start. Not the least of these was the presence of the rival Grand Canal which follows a similar route further south and on which work had started in 1757. Construction of the Royal Canal on the other hand only began in 1790 by which time the senior waterway was almost finished and already taking large quantities of commercial and passenger traffic. So when a group of investors established the Royal Canal Company, they had to petition the Irish Parliament for financial support, receiving £66,000 to add to the £134,000 already raised from subscribers. 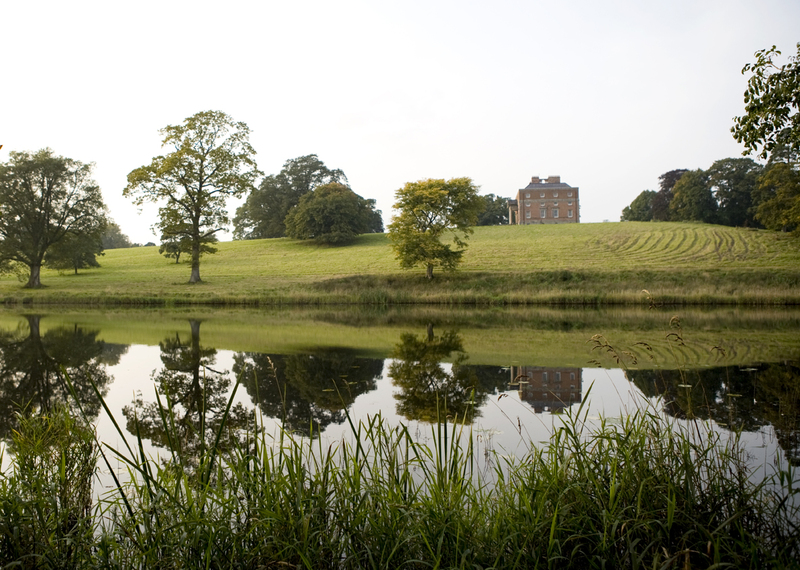 Among the key shareholders of the Royal Canal scheme was the second Duke of Leinster, who insisted that the waterway pass by Maynooth, the County Kildare town beside his estate at Carton. This necessitated cutting through extensive rock at Clonsilla and creating an aqueduct to cross the river Ryewater at Leixlip, both of which added greatly to costs. By 1796 the canal had reached Kilcock and the first passengers were able to travel between this town and Dublin at a cost of one shilling and one penny, cheaper than a seat on the traditional stagecoach. However progress on moving the route further west was slow and more expensive than had been anticipated. By 1811, despite being given almost £144,000 in government grants, the Royal Canal Company’s debts stood at £862,000. A parliamentary investigation into the business was undertaken and two years later the company was dissolved with responsibility for the project handed over to the Directors General of Inland Navigation who were instructed to complete work on the canal at public expense and with all due speed. In 1817 the Royal Canal finally joined the Shannon at a total cost of £1,421,954, seven times more than the original estimate. The following year a new Royal Canal Company assumed responsibility for the concern and built a branch line to Longford town which opened in 1830. 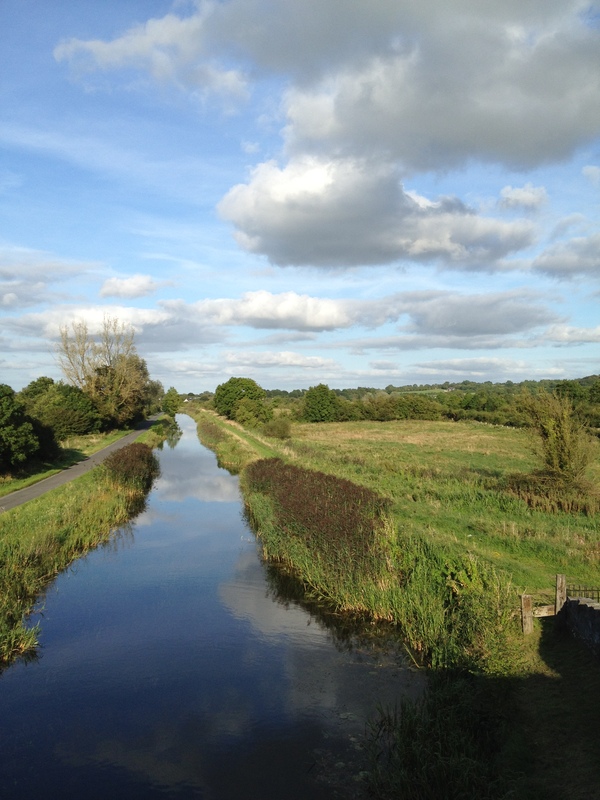 Now as then the Royal Canal runs for 90 miles (146 kilometres) through Counties Dublin, Kildare, Meath, Westmeath and Longford. The main water supply comes from Lough Owel near Mullingar which feeds the canal’s highest level. Its creation involved the building of 46 locks, four aqueducts and 86 bridges. 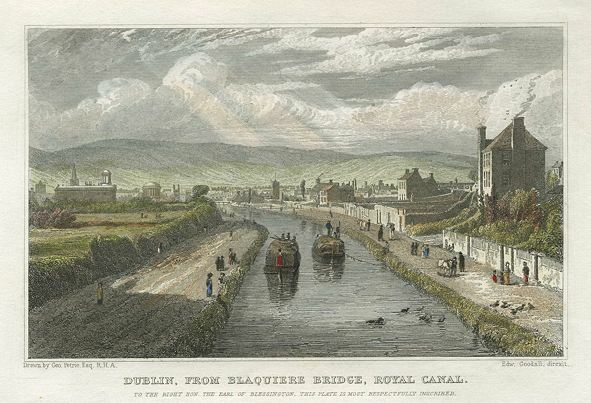 By the mid-1830s, goods traffic on the canal had grown to 134,000 tons annually, and passenger numbers stood at 46,000 in 1837 by which time the journey between Dublin and Mullingar took an average eight hours. But even at its peak, the Royal Canal was never as successful as the Grand Canal. And the arrival of railways the following decade had an immediate and devastating effect. In 1845 the Midland Great Western Railway Company bought the canal in its entirety for £289,059 with the intention of laying railway tracks on top of the route. The government did not allow this plan to proceed, but it explains why trains heading west from Dublin do so directly alongside the canal for many miles. In 1877 the old Broadstone canal harbour was filled in and the site used as a forecourt for the railway company’s new termimus; a branch line of the canal had already connected it to the Liffey at what is now known as Spencer Dock. Meanwhile, the Royal Canal went into steady decline, with the annual quantity of goods being carried on its route falling to 30,000 tons and passenger traffic gone. In 1938 ownership was transferred to the Great Southern Railway and six years later to the national rail company Coras Iompair Eireann. In 1955 the last boat officially to pass the length of the canal made its journey and the waterway was closed to navigation in 1961 after which it fell into serious disrepair. In the mid-1970s a group of enthusiasts started a Save the Royal Canal campaign and thanks to their sterling efforts, the route, which passed into the care of the Office of Public Works in 1978, was gradually restored. It took longer to refurbish than it had to construct: work on the last part of the Royal Canal was only completed in 2010. 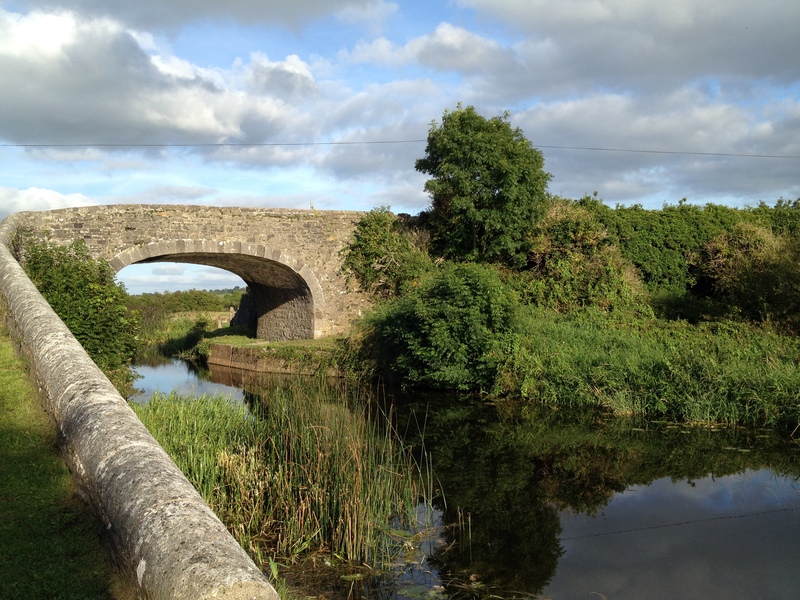 There are many reasons to celebrate the Royal Canal the most frequently cited being that it is an amenity beneficial to the tourist industry. That is certainly true and boats navigating its length bring visitors and income to towns and villages along the route. But let us leave matters economic to one side, not least because for over two centuries the Royal Canal has failed as a viable commercial proposition, inevitably costing more money than it generates. Though it might seem perverse to do so, this aspect of the waterway should be judged a cause for celebration, especially in the present era when the merit of everything and everyone seems to be based solely on the grounds of cost-effectiveness. Applying that criterion to the Royal Canal makes no sense, but instead demonstrates the fatuity of assessing value on economic grounds alone. What’s more important in this instance is that the Royal Canal provides an example of successful intervention in the natural landscape. We are inclined to believe all man-made intrusions damage the environment, but the Royal Canal offers conclusive evidence this need not be the case: far from impairing its surroundings, the waterway often enhances them. 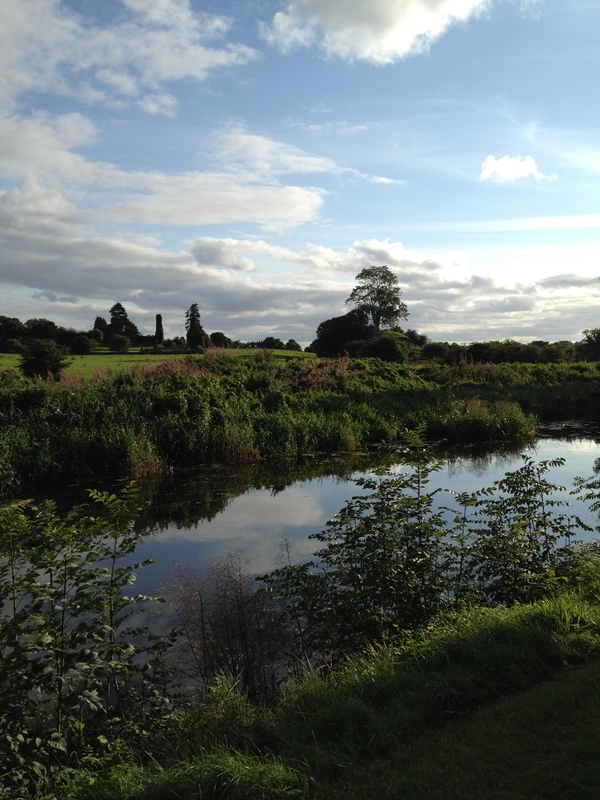 And that is what matters most: the Royal Canal as an object of beauty. The original scheme may have been ill-conceived and sometimes ill-executed, over-time and over-budget in its completion, but we are all now the grateful beneficiaries. That gives it a value beyond price. 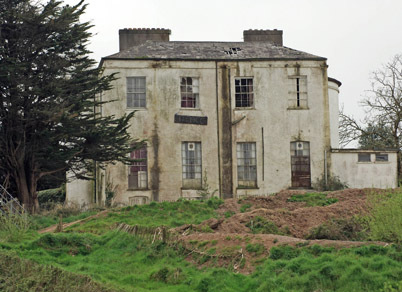 Woodbrook, County Wexford is believed to date from the 1770s but was badly damaged during the 1798 Rising. As a result, the building appears to have undergone considerable reconstruction in the first decade of the 19th century which is presumably when the tripartite Wyatt windows were inserted. 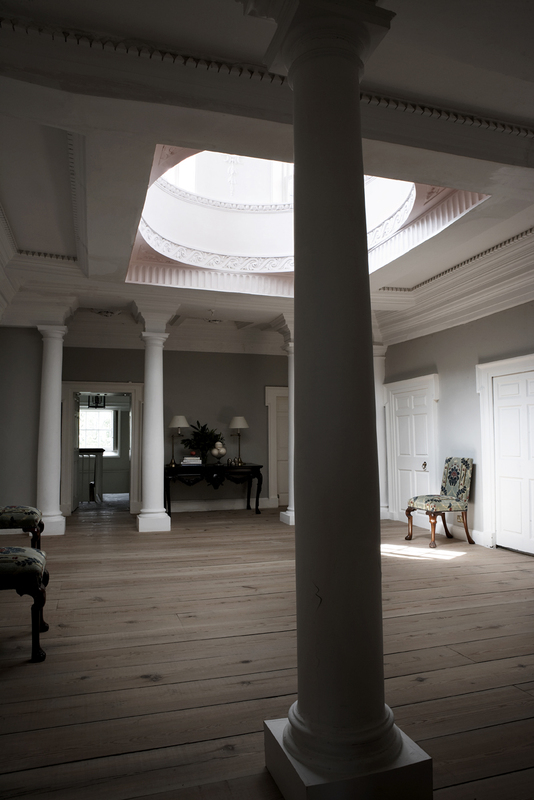 One of them provides ample light to the rear hall which contains the house’s principal feature: a wooden flying spiral staircase, the only one of its kind in Ireland. As you ascend or descend, the steps lightly quiver with every tread. Here is Bellamont Forest, County Cavan which can lay claim to being the most beautiful house in Ireland. Certainly its situation is unparalleled, since the building sits on a rise at the end of a mile-long drive, the ground to either side dropping to lakes, the world beyond screened by dense woodland. Bellamont is an unexpected delight, hidden from view until one rounds the last turn of the drive and sees the house ahead. In purest Palladian style and looking like a villa in the Veneto, Bellamont is believed to have been designed c.1725-30 by the pre-eminent architect then working in Ireland, Sir Edward Lovett Pearce who was also responsible for the Houses of Parliament in Dublin (now the Bank of Ireland), and a number of since-lost country houses such as Desart Court, County Kilkenny and Summerhill, County Meath. Pearce was a cousin of Bellamont’s builder Thomas Coote, a Lord Justice of the King’s Bench. The Cootes had come to Ireland at the start of the 17th century and prospered so well that within 100 years their various descendants owned estates throughout the country. 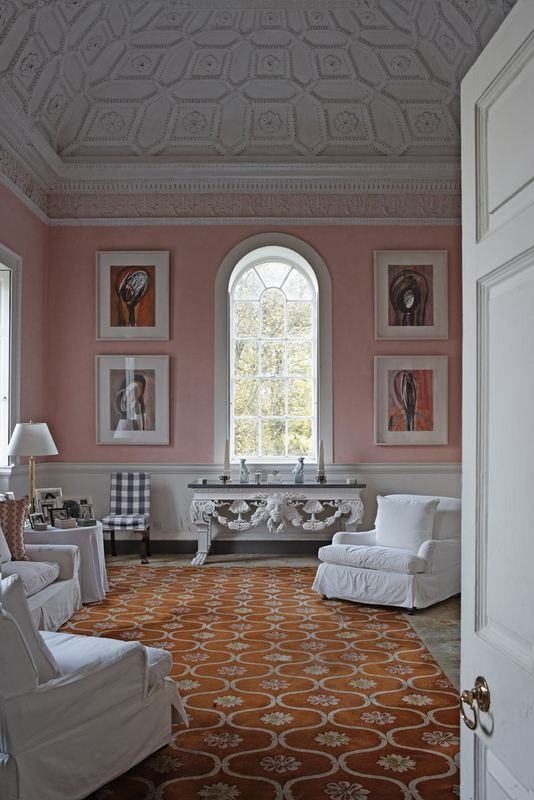 Ballyfin, County Laois which has recently undergone a superlative restoration was another Coote property. The appeal of Bellamont lies in its exquisite simplicity, beginning with an exterior which is of mellow red brick with stone window dressings. Of two storeys over a raised rusticated basement, the front is dominated by a full-height limestone portico reached by a broad flight of steps. The imposing effect is achieved by the most effortless means and using the plainest materials, but there can be no doubt that Bellamont was always intended to impress. The Portland stone-flagged entrance hall, with its coved ceiling and pairs of flanking doors, sets the tone for what is follow. 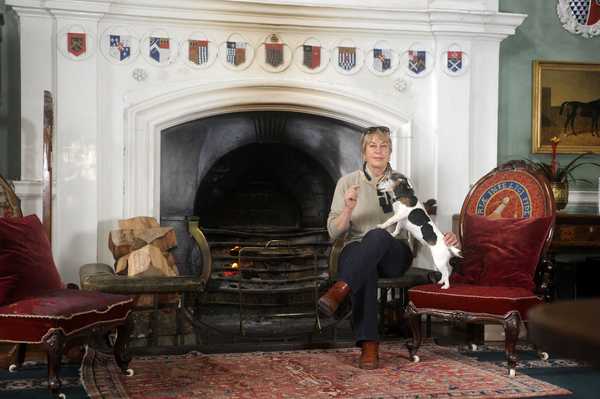 While there are small rooms immediately to right and left, the latter traditionally used as a cosy winter library, the main reception areas lie to the rear of the building, a sequence of drawing room, saloon and dining room which retain their 18th century decoration including the chimneypieces. 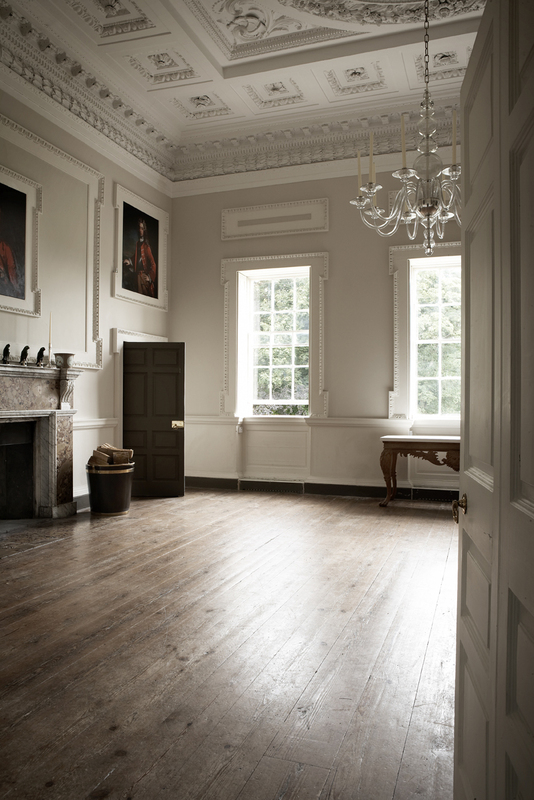 The first of these is believed to have once been a series of rooms, but following a fire in 1760 acquired its present form including the elaborate recessed ceiling which was probably intended to complement that in the dining room on the other side of the saloon. 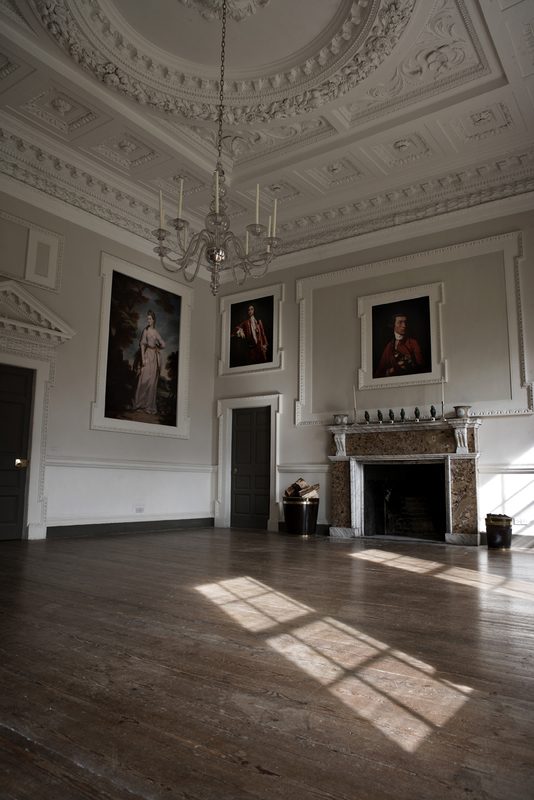 The walls of this central room contain contain stucco panels once filled with family portraits, the best-known of which – painted by Sir Joshua Reynolds in 1773 and showing the Charles Coote, Earl of Bellamont resplendent in his robes as a Knight of Bath – now hangs in the National Gallery of Ireland. The aforementioned Earldom of Bellamont was a second creation of the title for a member of the family. Evidently an ostentatious and pompous man – seemingly he insisted on making his maiden speech in the House of Lords in French, to the bemusement of his fellow peers – Lord Bellamont can at least be credited with having the good taste to enhance the house built by his grandfather. He married a daughter of the first Duke of Leinster and by her had four daughters and just one son who died in Toulouse at the age of 12, his body being brought back to Bellamont to lie for three days on the upper landing before burial in the family vault. As a result of there being no legitimate heir, the earldom again lapsed on Lord Bellamont’s death in 1800. However, despite being seriously wounded in the groin during a duel with Lord Townshend, he managed to have at least 16 offsring out of wedlock by four different women, and one of these sons, also called Charles Coote, inherited Bellamont Forest. Ultimately it was sold out of the family in the middle of the 19th century and bought by the Smiths (later Dorman-Smiths), one of whom Major-General Eric Dorman-Smith served in the British army during both the First and Second World Wars after which, having changed his surname to O’Gowan, he became involved with the IRA. 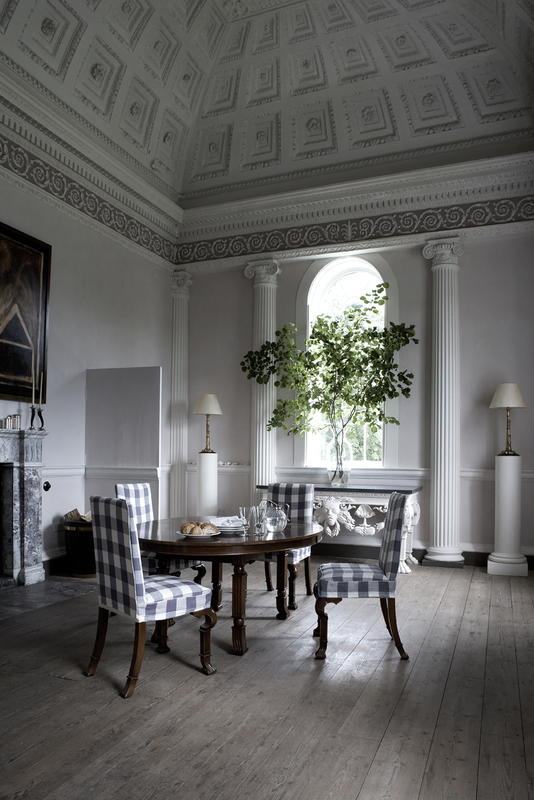 In 1987 Bellamont Forest was bought by John Coote, an Australian interior designer whose family had emigrated from Ireland at the start of the last century. 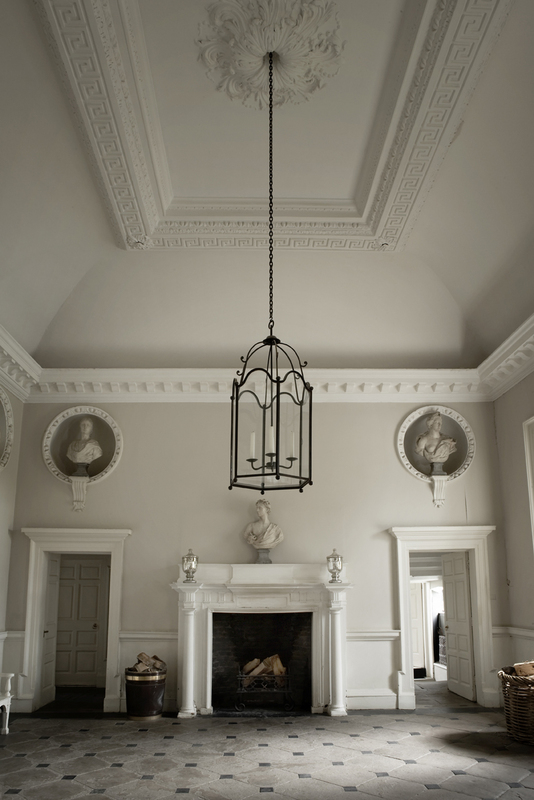 John dearly loved the house and undertook to restore it to a pristine condition, keeping the decoration spare so that the beauty of the rooms’ architecture would be more apparent. There was never a great deal of furniture, just a few large pieces he had specifically made and which were inspired by Georgian workmanship. In revealing the building’s purity he not only demonstrated the splendid taste of Pearce but his own also, since it would have been tempting to intervene in the interiors. Those interiors served wonderfully for entertaining, which John did frequently. I have been to a great many terrific parties at Bellamont, and even hosted a few there, one of which – a birthday dinner for 30 – is thankfully uncommemorated by any photographs. But there are ample souvenirs and joyous memories of John’s own sundry social gatherings, such as the thé dansants he loved to throw, when a 16-piece orchestra would play in the saloon and Jack Leslie would demonstrate how to dance the Black Bottom. The last great party at Bellamont took place during the summer of 2009 to mark John’s 60th birthday and was spectacular even by his standards, with drinks in the lower gardens followed by dinner and dancing outdoors in the balmy air. The following year John was obliged to put Bellamont Forest up for sale, and thereafter he rarely visited the place. Tomorrow marks the first anniversary of his death, which happened unexpectedly while he was working in Indonesia. He is still sorely mourned by all of us who knew him in Ireland. Meanwhile Bellamont slumbers, awaiting a new owner who will kiss the place back to life; there is talk now of an auction in March. One prays that whoever next assumes responsibility for Bellamont will bring to the house the same flair and fun as did John Coote for so many years. A door on the top floor of Tullynally, County Westmeath, formerly Pakenham Hall and home to generations of the Pakenham family. Note the traces of gilt on the brass handle, and also the manner in which its quatrefoil design is echoed by that of a panel to the left. This cliff-edge garden in East Cork opens onto a seemingly-infinite horizon. 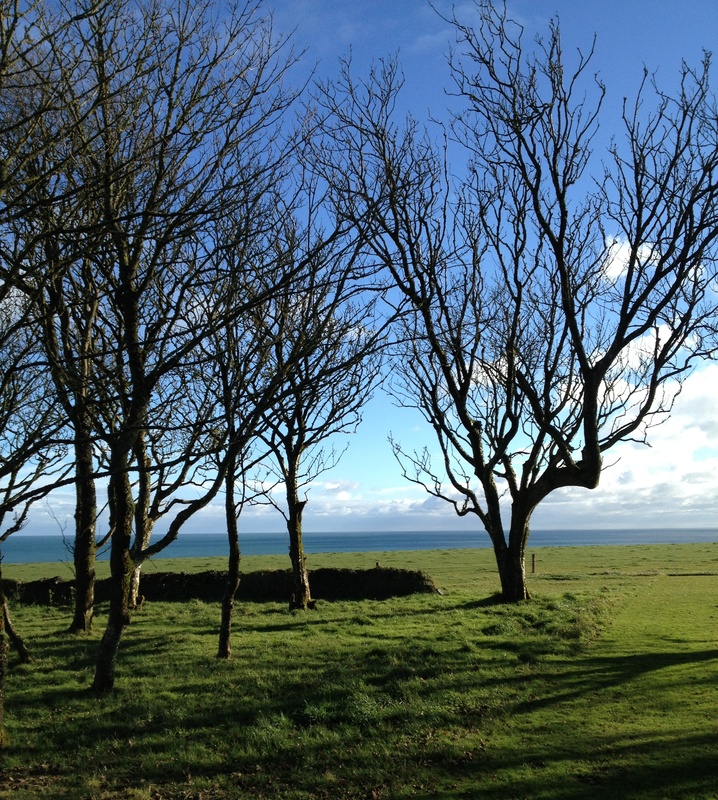 A copse of trees in the foreground shows signs of having to face the onslaught of winds blowing without interruption across the Celtic Sea. In April 1801 Sir Henry Browne Hayes, a widower approaching fifty, was brought to trial in Cork for abducting a Quaker heiress Mary Pike four years earlier and forcing her to participate in a spurious marriage. Given that the facts of the case were common knowledge and that Hayes had voluntarily surrendered to the authorities, it did not take long for a guilty verdict to be reached and for the felon to be sentenced to death. On the recommendation of Ireland’s then-Lord Lieutenant, the Earl of Hardwicke, this was commuted to transportation for life to Botany Bay. Hayes’ passage was less grim than that of the average Irish convict, since he was provided with his own cabin and allowed to bring a manservant. A year after arriving in Australia, he purchased a property immediately north-east of Sydney and there built himself a house called Vaucluse which still stands and is today managed by the Historic Houses Trust of New South Wales. After sundry adventures (he seems to have been incapable of leading a quiet life), including founding Australia’s first Freemason lodge and being sent to work in a coal mine for backing Governor William Bligh during a period of dispute in the colony, Hayes eventually secured a pardon and was allowed to return to Ireland. Even this journey was fraught, since the vessel on which he travelled, the Isabella, was shipwrecked off the Falkland Islands. Among the other passengers on board was Joseph Holt, a County Wicklow man who had been one of the leaders of the 1798 Rebellion and who, like Sir Henry, had been given transportation, and subsequent pardon, rather than the customary execution. On their arrival in Ireland it was ironically noted the crimes of both men involved pikes: Hayes had abducted one and Holt had distributed many. Back in Cork, Sir Henry settled into his family residence where he died at the age of 70 twenty years later in 1832. 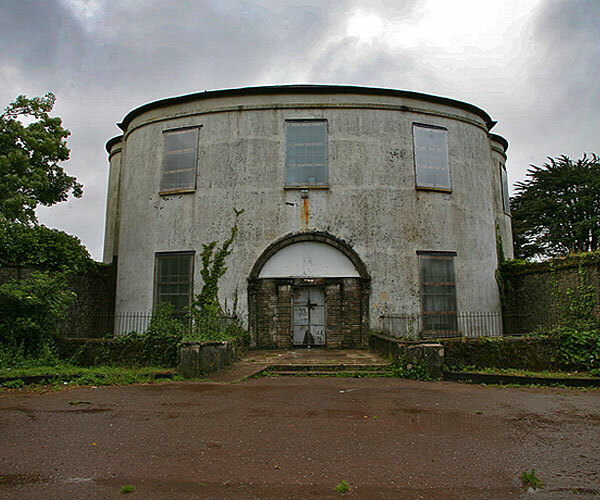 * That house, Vernon Mount, featured last week in the Irish Times where it was reported that the relevant local authority, Cork County Council, had taken steps to secure the building’s future. There are few houses in the region more deserving of preservation, and yet, despite repeated calls for intervention, Vernon Mount has suffered shameful neglect in recent decades. 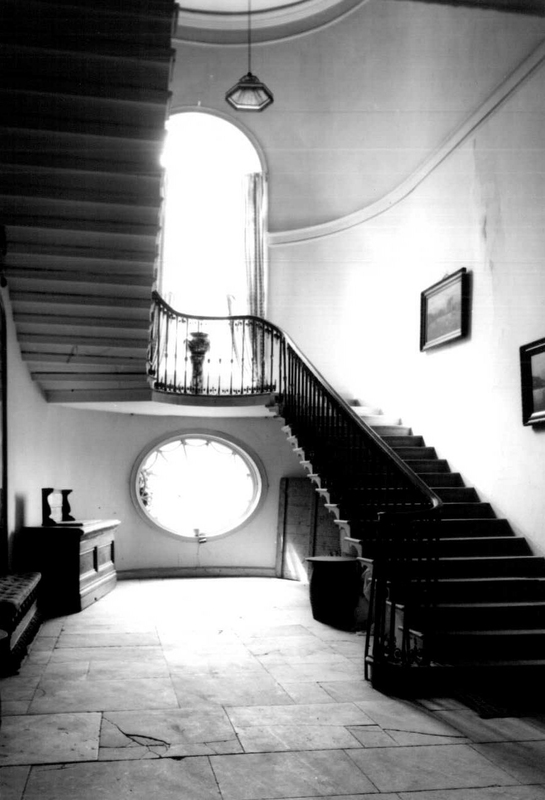 If the place was only then deemed new, the supposition is that it had been designed by Abraham Hargrave (1755-1808), a locally-based architect who worked during this period on a number of projects in Cork City and County. Evidently the house was not let by Hayes, since he brought Mary Pike there after her abduction. Incidentally, Vernon Mount’s name is a salute to George Washington and his own residence Mount Vernon in Virginia; a number of Irish house owners paid similar tributes to the American War of Independence as a means of showing their political sympathies. 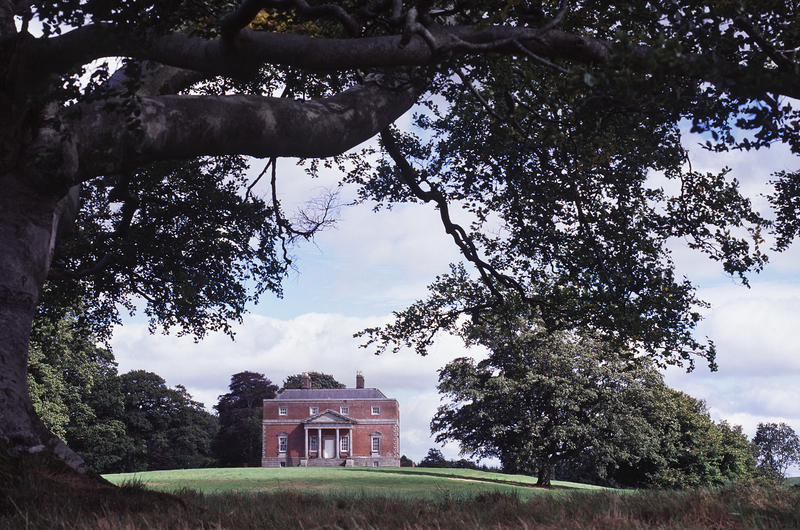 There is a further connection between Vernon Mount and the United States: the artist responsible for the house’s remarkable painted interiors, Nathaniel Grogan the elder (1740-1807) spent a number of years on the other side of the Atlantic before returning to his native city. Here he was commissioned to work on the decoration of Vernon Mount, including a ceiling painting on canvas in the drawing room. 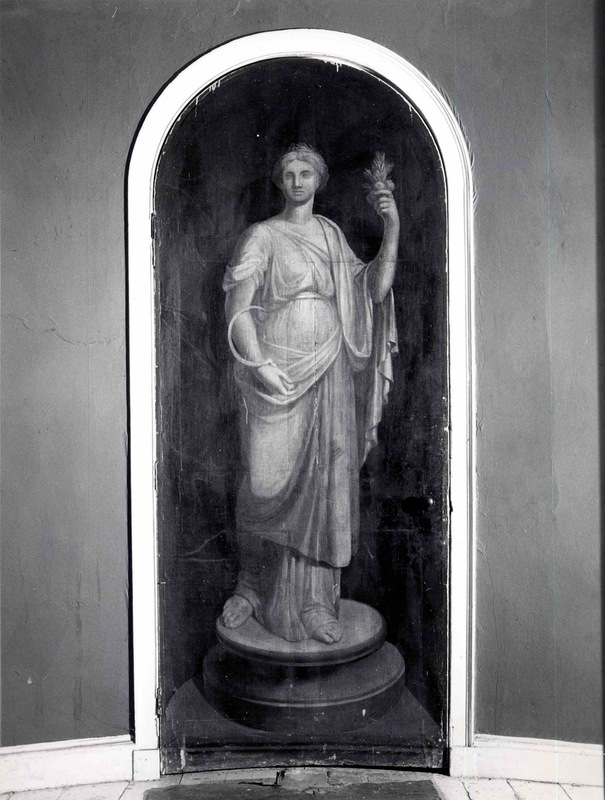 Within an octagonal frame, this depicts Minerva Throwing Away the Spears of War, a reference perhaps to the cessation of hostilities at the end of the American War of Independence. Around the central work are a series of lozenge-shaped panels and roundels featuring floral motifs, angels and centaurs. 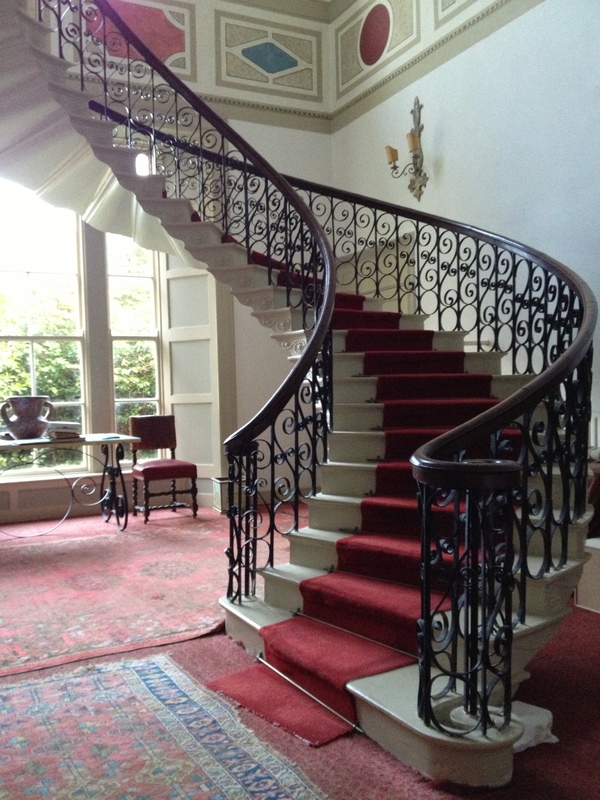 Additional examples of Grogan’s handiwork exist on the first floor, reached by a splendid cantilevered stone staircase with neo-classical wrought-iron balustrade, the whole lit by a large arched window. On the oval upper landing are eight marblised Corinthian columns interspersed with seven doors painted with tromp l’oeil niches ‘containing’ classical statues and urns; these doors lead to the house’s bedrooms and a concealed service staircase. It should be evident from this description that Vernon Mount is a house of enormous architectural importance, to be treasured and protected. But, as already mentioned, of late this has not been the case. 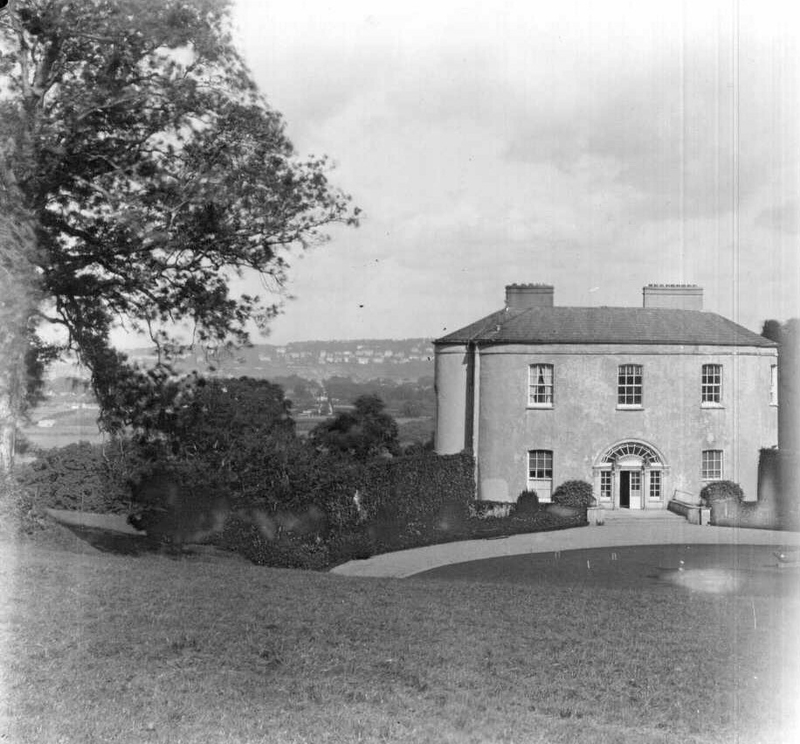 Occupied as a family residence until the middle of the last century Vernon Mount and its surrounding parkland were bought in the 1950s by the Cork and Munster Motorcycle Club, which developed a motor race track around the house. However, the latter was well-maintained until the whole place was acquired in the 1990s by a consortium of developers led by San Diego-based IT entrepreneur Jonathon Moss and his colleague in Cork Olaf Maxwell. 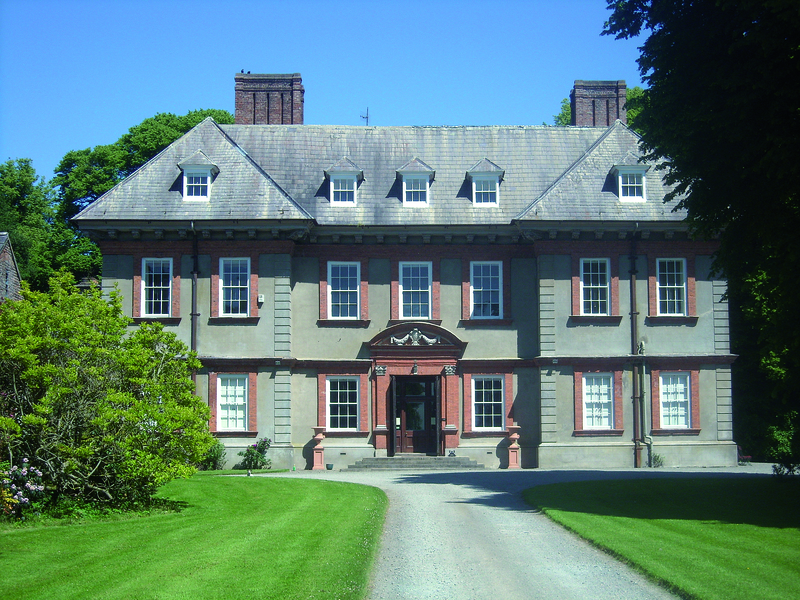 This consortium applied to redevelop the house and surrounding grounds as an hotel, but when the proposal was refused by Cork County Council (which described the proposal as ‘a gross over development of the site’ that would ‘be seriously detrimental to the setting, scale and character of a listed building’), the owners settled down to do precisely nothing. 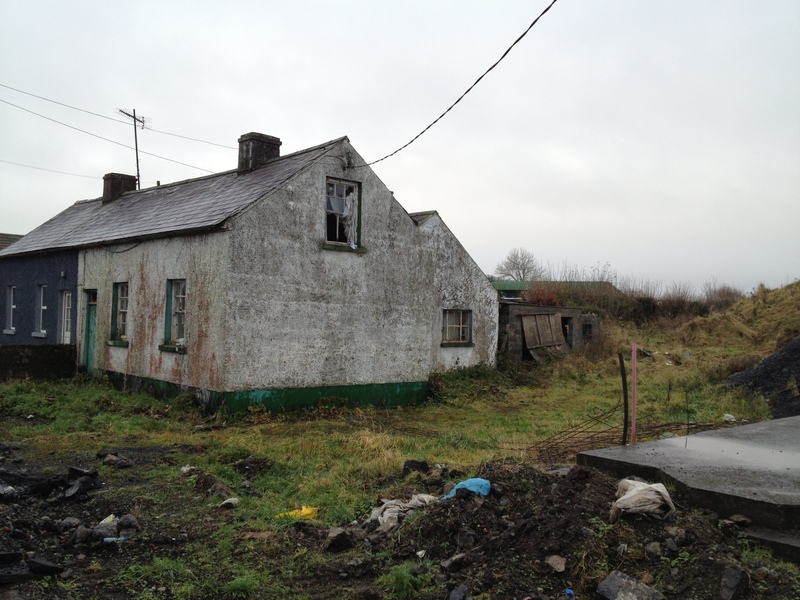 Shamefully Cork County Council chose to mimic this inactivity and as a result Vernon Mount’s condition was permitted to deteriorate. 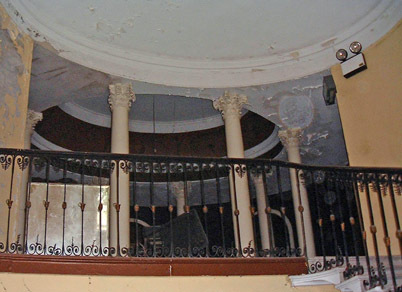 The Irish Georgian Society repeatedly called for intervention but to no avail, and in 2008 the organisation arranged for the building to be placed on the World Monuments Fund List of 100 Most Endangered Sites. Still the local authority failed to act, even though two years earlier at a council meeting it had been agreed that if something were not done soon the building would be lost forever. It appears that local residents groups, keen to have the entire area designated a public park and amenity, have taken to lobbying the county council; finally last month it used powers available under the country’s existing planning acts to carry out essential repairs to the roof of Vernon Mount. Of course this is excellent news, but the fact remains that the local authority could have availed of the same powers to take action sooner; that it failed to do so is a disgrace. 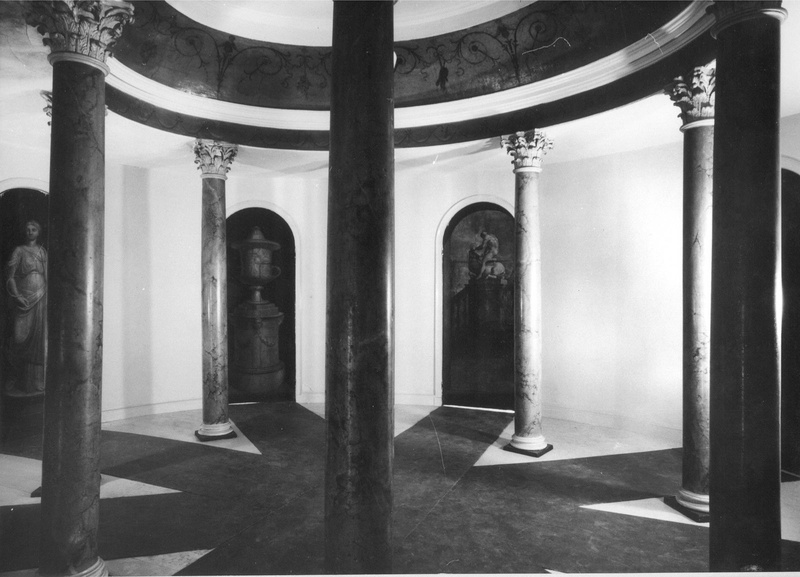 One of the unanswered questions remains the condition of the interior with its unique Grogan paintings; for a long time it has long been impossible to persuade the owners to allow regular access. Australia cherishes Vaucluse and the United States Mount Vernon. In Ireland, on the other hand, there will be more scenarios like that at Vernon Mount unless and until the statutory bodies charged with responsibility for ensuring the welfare of the state’s architectural heritage actually do their job. 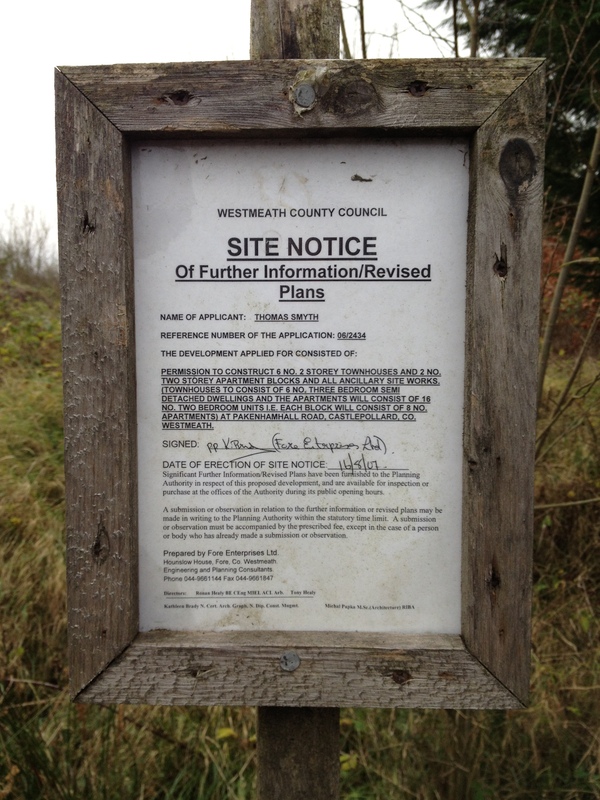 This is a shabby tale, from which neither the consortium nor the county council emerges with credit. *Poor Miss Pike, carried off in the night by Hayes, never recovered from her ordeal and around the same time as her abductor died, so did she – in a lunatic asylum. Beaulieu, County Louth is one of Ireland’s most distinguished early houses with a superlative double-height entrance hall. It has been owned by successive generations of the same family since the lands on which Beaulieu stands were granted to Sir Henry Tichbourne by Charles II in 1666. The building is believed to have assumed its present form at the start of the 18th century during the time of Sir Henry’s grandson, also called Henry, first (and last) Baron Ferrard of Beaulieu; the name of John Curle is usually cited as probable architect. Most recently Beaulieu has been under the care of the tenth generation of Sir Henry’s descendants, Gabriel de Freitas, who very sadly died this week. 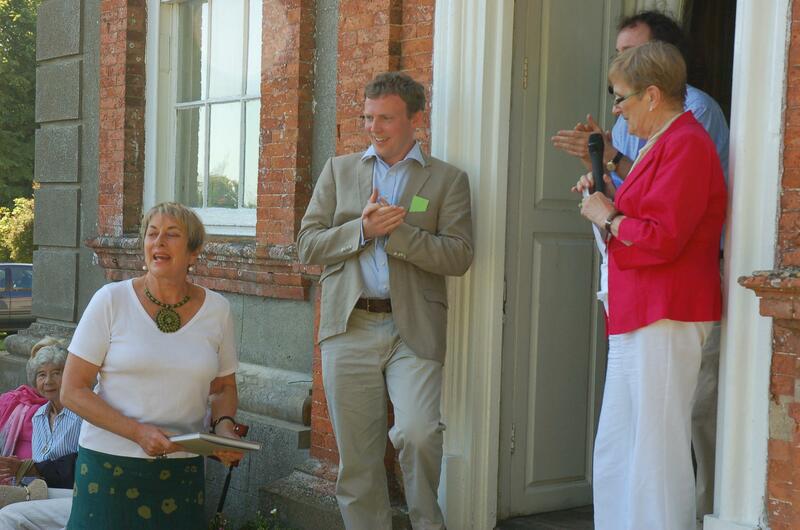 Here is a photograph of Gabriel (standing left) in 2010 when she kindly hosted the Irish Georgian Society’s summer party at Beaulieu. She was a wonderfully forceful character who in earlier decades had been a well-known racing driver and had built up an impressive collection of classic cars. I remember the first time we met, at lunch in Leixlip Castle, mentioning to her Fiona MacCarthy’s 2006 book The Last Curtsey, in which both Gabriel and Beaulieu appear. The response could best be described as trenchant: Gabriel was most displeased that the author had failed to consult or notify her in advance. (Incidentally, another debutante of 1958 discussed by MacCarthy in the same work was Rose Dugdale, who later joined the IRA and took part in the 1974 art robbery at Russborough, County Wickow). Having returned to Ireland only a few years ago to assume responsibility for Beaulieu, it is cruelly unfair that Gabriel, who was so dynamic and vital, should have been denied the opportunity to do more for the place where her family has lived for almost 350 years. One hopes that with her customary speed she has gone to enjoy the company of her angelic namesake.